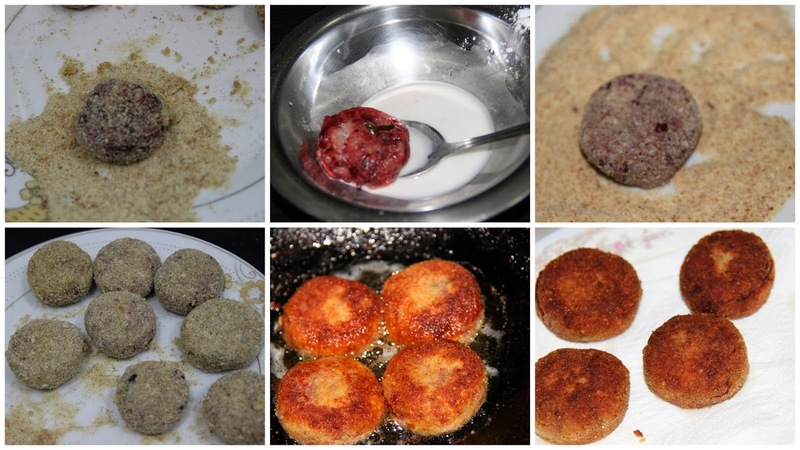 The earthy taste of the beetroots makes the cutlets very special. The colour of beetroot is so inviting and kids would love this. It is indeed a favourite snack for the whole family.This can be served as an appetizer or a tea time snack. I am sending this recipe for 'Cook with Red Event' announced at Merry Tummy. In a pan add 3 teaspoons oil and add onion and sauté till soft then add green chillies and ginger garlic paste and cook till raw smell leaves. Add the grated beetroot and sauté on medium high flame till raw earthy smell goes and become a dry mixture. Then add pepper, garam masala powder and salt with this mixture and cook for a minute and add the mashed potato and mix well with this masala. Check the salt and switch off the gas and allow this mixture to cool. Add maida with this mixture and mix well. Take a gooseberry sized ball and make it flat like patties. Mix water with the corn flour and make thick slurry. Roll the patties first in bread crumbs then in cornflour slurry and roll this again in bread crumbs. Deep fry or shallow fry this in oil and keep on the paper towel to drain extra oil. Note: Don’t mash potatoes while it is hot. Before making into patties the mixture should be cooled thoroughly. Otherwise the patties gets soggy. Non vegetarians can replace beaten egg instead using corn flour slurry. This is beet season, I assume. 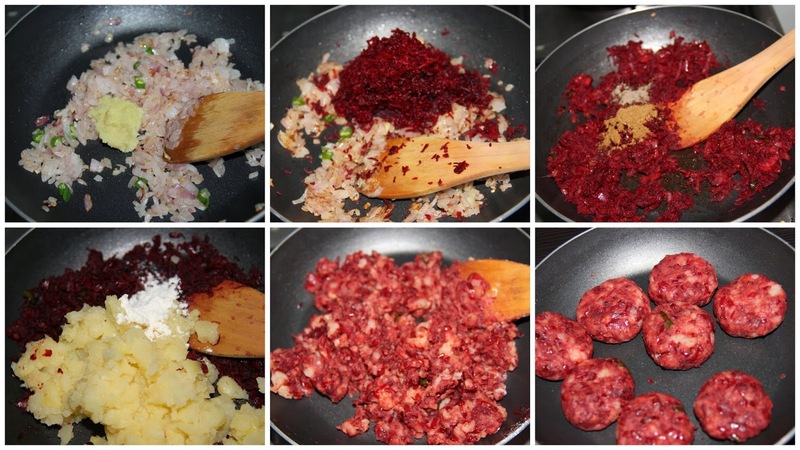 Wherever I see, lots of beet recipes :D Tikkis looks delicious, must try on kids.